Rarely do I find myself reading a book and marveling, "This is the perfect book at the perfect time." 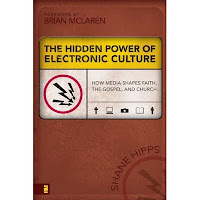 Shane Hipps' The Hidden Power of Electronic Culture is this book for me. This helpful work describes in detail how electronic culture (particularly digital communications technology and the Internet) shapes human minds, culture, and the Church. If you've visited this blog recently, you'll know we've been grappling with changing culture, social media, smart phones, all these and more. We're wrestling with how these present the Church with challenges and opportunities that are simultaneously dizzying, disorienting, and exhilarating. Hipps does a masterful job alerting us to the contours and shifting sands of this ever-changing postmodern landscape. He uses the brilliant insights of Marshall McLuhan to help us see not only the tools of the latest technology, but also their hidden power to create culture and shape communities. McLuhan, some may remember, was the media ecologist of the 1960s best known for his famous quote: "The medium is the message." Hipps takes issue with the old evangelical saw "The methods may change but the message remains the same." Hogwash, says Hipps. The methods of communication, whether the printed page, radio, TV, or the Internet, powerfully convey their own message and have the ability--in themselves--to transform the way we think, feel, communicate, and "do Church." No medium, in other words, is neutral. Hipps then launches us on a breathtaking gallop through McLuhan's thought, giving us tools to scrutinize new technologies and observe how the Church and Christianity have been profoundly shaped by the advent of new media, moving from oral to written to visual modes of communication. In particular, Hipps reminds us that all media is an extension of either a human body part or capacity. For example, the printed page (and later the television) is an extension of the eye. The radio is an extension of the ear, and so forth. Hipps then shows us how each medium makes an earlier technology obsolete (telephones replace telegraphs, email replaces snail mail, etc). He demonstrates how if a certain medium is pushed to its extreme, it will reverse in the opposite direction (cars, which made transportation faster, can get caught in traffic jams, which slow down transportation). Finally, the author shows us how each medium retrieves some earlier experience or medium from the past (texting, for example, retrieves the telegraph). These four observations form a grid for us to critique the gifts and dangers of emerging media. Hipps applies these insights to church leadership and structure, as well as worship styles. This entire discussion serves as a helpful outline for the move from modernity to post-modernity. I'm not one for hyperbole, but I have to say it: this is a brilliant book. Clear, concise, crisp prose makes its 165 pages a quick read. The analogies and illustrations are spot-on. Relevant, prophetic, breathtaking--a must-read for our church leadership and anyone interested in discerning what may be the new shape of church in the 21st century. Visit the author's website at www.shanehipps.com for more! I just met with a colleague to discuss challenges in ministering to our senior adults. Due to budget constraints and a desire to optimize resources (and care for our environment as well), we've recently gone to a shorter Sunday church bulletin format. This has meant that announcements have been significantly abbreviated. We're steering people to our new Connections Center kiosk in the foyer (we call it the Narthex, but that sounds like a nasal spray). Here, volunteers can help folks find pertinent information about ministries and programs. We've also sought to point people to the Internet for more details. This is great...except for our 400+ (mostly senior) adults who do not have access to the web or email. So here's the rub: how do churches (and for that matter, non-profits or even businesses) with limited incomes stretch their resources to reach a wide variety of generations, some of whom aren't tech savvy? Do we spend most of our efforts and cash to reach newer generations? Do we reserve cash (and time, paper, and ink) to continue to print expanded bulletins and do costly mailings? Technology, the economy, emerging (and aging) generations--all of these get stirred into the mix. How do we keep the family together amidst such change? Certainly, it requires creative thinking: we need to learn how to do more with less, to find ways to communicate that are cost-effective and yet, at least somewhat, generationally aware. My suggestion to my colleague was to establish phone-trees to involve older members in the responsibility for disseminating timely information to their peers. Also, we will need to educate our older population (and church visitors, too!) about skills needed to navigate a changing landscape of information (how to find the new Connections Center, whom to call, which brochure to pick up, etc). We've got to be intentional about including older generations, even as we rush into new technologies and ways of connecting. It also occurs to me that we can't give up on our older adults and assume that many of them cannot learn (or are not interested in) new technologies. I know first-hand this isn't the case for everyone. Many of my friends in our congregation are 80+ and very familiar with the web. Still, we need to educate, equip, and include. I long for some way to link young people (maybe college students who have a bit of spare time?) to older adults, to coach them on setting up high speed internet access and learning to surf the web and do email. Added benefit and business tip: I suspect this could be niche market for a small business (or maybe there already are such businesses offering this type of intergenerational consultancy?). In the past, our church has offered computer classes to our older adults. The trouble, I've heard, is that these students learned on one type of computer at the church, but had a different system at home. At-home tutorials would seem to make the most sense, though they may not be the most efficient and time-effective. In the multigenerational church, we've got our work cut out for us: how do we keep the family together? How do we let generations be where they are but not get left behind? How do we merge onto the information superhighway--embracing new people, new technologies, and new opportunities--but not leave our beloved seniors by the side of the road? Thoughts, anyone? !